Featuring a “PMX” polymer matrix construction the PSA 35 round 9mm series magazines, combine an engineered thermoplastic magazine body with inserted stainless-steel feed-lips. Providing users with improved performance and reliability. Impact & chemical resistance engineered thermoplastic body. Impact resistant floorplate with and elastomeric strike plate. Will this work with a glock? Glock no, XD yes. Go buy one of those. Can this clip be used on a Keltec Sub 2000? C'mon Mom,lighten up! Tons of people call 'em clips. It is a magazine. When you call it a clip you sound like a gun controller. Will these work in the scorpion evo? BEST ANSWER: According to PSA they are compatible with the scorpion! I can confirm, these absolutely work in a CZ Scorpion. They work great in mine. You will have to do some semi -aggressive sanding on the top left to keep them from binding on the bolt gold open, but they function flawlessly! From all reports and AK-V info, yes. Yes and they work great. Will this work on the PSA Shockwave 9mm? BEST ANSWER: I bought two specifically for my scorpion and haven’t encountered any problems. Are these made entirely in the USA? Asking because of use for 922r compliance. BEST ANSWER: It has a US Flag on the side of the magazine and it says Made in USA under it so I’ll say yes. You’re not an importer so 922r does not matter. Will this fit the Sig Sauer MPX 9mm Carbine? Will there ever be AK-Vs available to insert these into ? Will this work with the glock lower for my AR-9 or will it work with a HK vp9? BEST ANSWER: Not in the conventional sense. 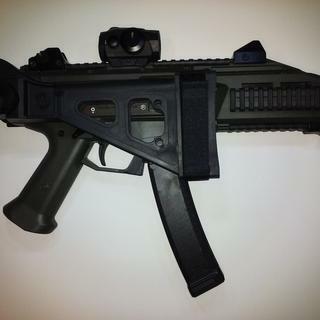 APC9 (Brugger & Thomet) ? Do these mags have witness holes or a way to view rounds? Will this fit a PTR 9mm? Will it fit a Taurus pt111? Will this work with colt style? I am finishing an 80% 9mm lower that uses glock mags. Will these work for my sbr 9mm lower? Can this mag be used in a ar-9 Glock style lower? Can I buy the magwell for a project? will this work in RUGER 9MM carbine with Glock adapter installed? BEST ANSWER: Noooo,... I don’t know why you think it would considering this is not a Glock magazine. In all reality it’s nowhere near the size of a Glock magazine. Works absolutely great in the Scorpion though! No , these will NOT work with anything that takes Glock mags. They will only work for the PSA AK-V and the CZ Scorpion. No. This is not a Glock compatible magazine. 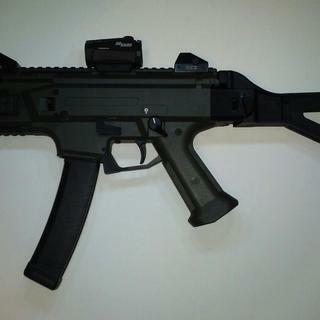 It will work with the CZ Scorpion as well as the AKV. No. It is a CZ Scorpion-patterned magazine, not Glock-patterned. No. 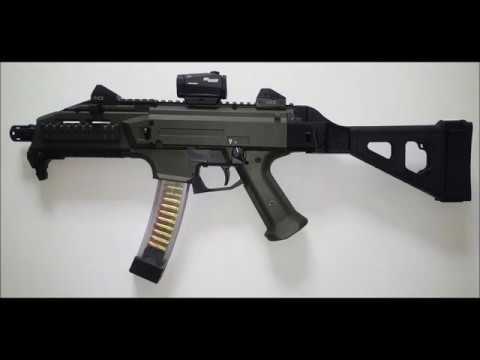 They are patterned off of the CZ Scorpion Evo. No only in the PSA 9mm ak and the scorpion Evo. No, this is a CZ Scorpion patterned magazine. No. This fits AK-v and the CZ Scorpion. will this mag fit in regular 9mm mag pouch? BEST ANSWER: It is a fairly new product plus it holds 35 rounds so it may fit if what you are decribing is not a single/double stack pistol mag pouch, but you should consider purchasing a cz scorpion mag pouch to make sure it fits. You need to be more specific. What kind of pouch...? You know these mags will fit the CZ Evo right..? So any mag "pouch" that can handle the Evo (9mm mags) may work. I purchased these for my Evo. Not in a snug-fitting double stack pistol mag pouch. Its footprint is ~ 1.75x1”& 9” tall. I've been looking high and low for some thirty caliber clip so I can disperse 30 magazine clip in half a second. Will this fit my ghost bullet gun? Asking for a friend, thanks. BEST ANSWER: This will not work in your ghost gun since you are looking to disperse a 30 caliber clip in half a second. This magazine clip is made for dispersing of 0.35 inch ghost bullets and is a 35 caliber clip. Also must be in the ghost form of a scorpion to fit. If you were to aquire a new ghost spirit gun that met those qualifications then these would work great. Boy oh boy, people ask the darndest questions! ? Will any of the scorpion mag extensions work with this? Taylor freelance, Taran etc. 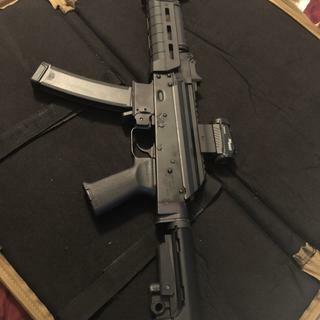 Will this fit an MP5? Will it work with a glock43 9mm? I had held off from ordering the mags due to the reviews online. Glad I ignored and ordered 4 mags. All fit in my Scorpion with no issues going in or being to tight. No they do not just drop free which is fine by me as I normally do not just drop my mags to the ground unless I have to. you don't want the B2HO and you hate mags that drop free from your EVO. Other than that they work great, kind of like running an AK. Difficult to recommend for the EVO, as they completely reduce the weapons efficiency. Best CZ Scorpion mags money can buy. Awesome mags!!!! They work flawlessly in my CZ Scorpion! This mags fit and function fine in my CZ Scorpion EVO 2 carbine. I actually like the fac that they dont drop free. Bought some of these to use in the Scorpion. They are reliable but don't drop free without sanding a bit off the edges. The mag release is positioned for the mag to be stripped anyway so no problem, left them like they are. 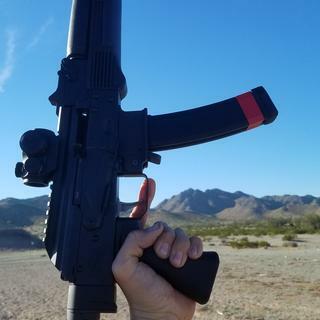 Purchased two of these magazines for use with my Sorpion Evo carbine, Finally had the opportunity to try them out yesterday; they performed flawlessly. I plan on purchasing a few more in the near future. These mags work great for the CZ Scorpion but do not drop free on release (reason for 4/5 stars). With a little sanding, they can be made to drop free like factory CZ mags. Love the metal feed lips! 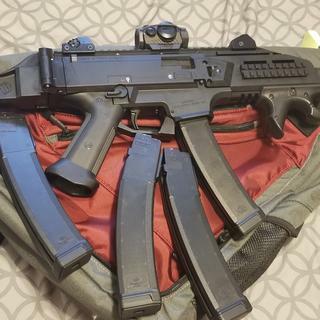 This mag by far has the highest capacity of all my varying CZ Scorpion Mags. That coupled with the price is just unbeatable. I definitely recommend. Looks good. Would like to try! Nice looking mags. I have them all loaded up and ready to go, but no AK-V to use them with :( Would love to add one of those to my shopping cart, too! What's the latest ETA on these guns, PSA?? Nice mag, still wish that it dropped when mag release was pressed though. Fit great in a scorpion. Bought to go in a CZ scorpion. They fit great. Would have given it 5 stars but they did not drop free. Took a bit of sanding to drop free. Fit and finish is good to go otherwise. I will be getting more in the future. Construction looks good with metal lips molded in. I’ve run a couple of mags dry no protwhat so ever. Works just as well as OEM magazines, but offers increased capacity! This product is awesome and works great in the AK-V and also in the CZ Scorpion Micro and regular CZ carbine. I will buy again..
Functioned flawlessly in my scorpion evo 3. If you want the hold open to work you are going to have to do some semi-aggressive sanding on the very top right of the magazines. That part binds with the bolt hold open and will keep it from engaging most of the time. After sanding they are 100 percent! 500 plus rounds with no issues. When used in Scorpion EVO3, last round bolt hold does not function with any of the 4 that I purchased. Mags will not drop free. The feed fine and seem to be sturdy...but you’re turning your scorpion into and AK if you use them. AKV mags 100% Flawless. Buying more soon! 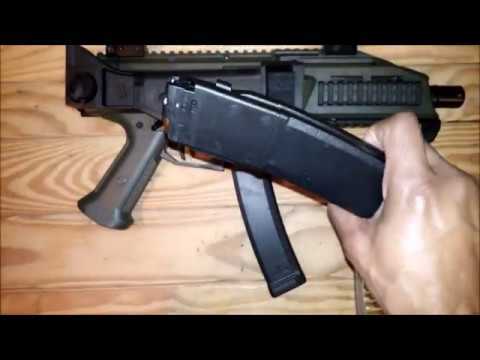 Using PSA AKV mags in CZ Scorpion. If you’re buying them for a CZ Scorpion I would look at other options on the market. If you plan on using these magazines in a CZ Scorpion I would be cautious. With the following information, keep in mind I had a sample size of 2 so take it as you will. Of the ones I used I could not get them to reliably LRBHO, I would get it sometimes, but not all the time. 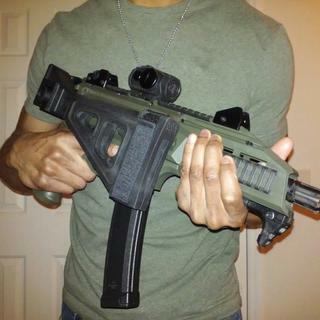 They essentially made my Scorpion into an MP5, leaving me having to manually lock the bolt to the rear on an empty mag. They also would not drop free from the magwell and had to be forcefully stripped to get them out. Bought these for use in my CZ scorpion. Thanks for offering a good mag with reinforced feed lips. Ordered two and they work great in my scorpion. The fit is a little more snug than the factory mags. Really like the metal reinforced feed lips compared to the factory plastic. Best MAGS FOR THE BUCK! Definitely the cheapest mag out there for CZ and holds 35RDS!!!! Purchased 5 and tested in my Scorpion, a little tight in the magwell but overall the product feels amazing and looks extremely well made. I have 3 loaded to 35rnds ea and had no problems loading and test feeding. Can't wait to buy a few more.